Mustard Maple Brussels Sprouts will brighten your holiday table with the vibrant color and flavorful combination. Enjoy warm, at room temperature, or chilled. This is the last Thanksgiving recipe I plan to post. And in fact, this is the last post for a while. Our family is going to start showing up on Saturday, and I’m taking a little break to fully enjoy my time with them. It’s rare that Hubby and I get to spend holidays with both of our families since mine is from IL and his is from CT. Almost everyone is going to make it and we’re just going to soak up all the family-ness of the week. 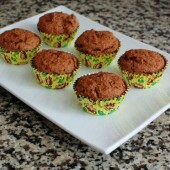 I’ll be back in December with some new recipes for you guys to check out. I first made these Mustard Maple Brussels Sprouts last winter. You see, I have a love affair with pomegranates in the winter. I seriously cannot.get.enough of them. I love the color. I love the flavor. I love the texture. I just love everything about these little gems and put them in and on everything imaginable. Sometimes it works. Sometimes it doesn’t. But mostly it does work, which is a good thing. 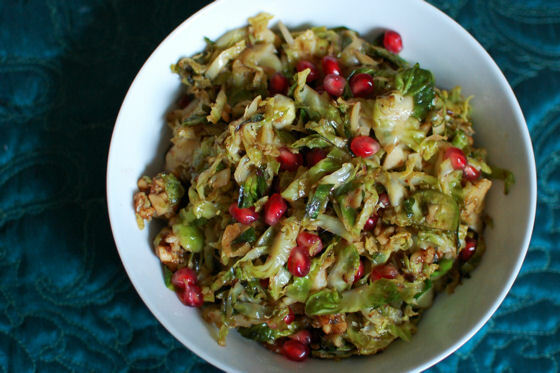 Brussels sprouts are one of my favorite vegetables and this dish is perfect for the holidays. It keeps in the fridge pretty well so you can make it up to a day in advance. Just leave the dressing off of it and toss it all together right before serving. I even like this dish cold or at room temperature. It does not have to be served warm to be enjoyed. 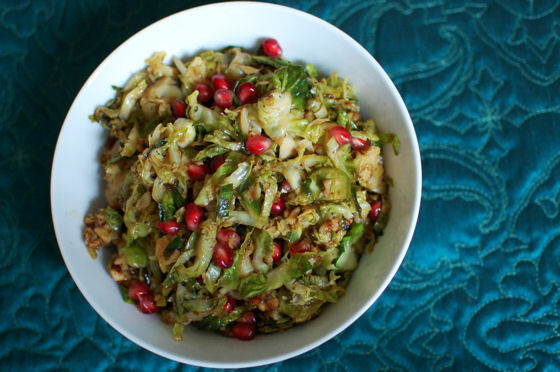 So if you’re looking for one more dish to add to your holiday menu, check this one out. Bonus points for adding something green to the table! Place a piece of parchment paper on a plate. Place the walnuts and maple syrup in a nonstick skillet and season with salt and pepper. Bring to a gentle boil over medium-high heat and cook for 6-7 minutes. Spoon the walnuts onto the parchment in a single layer and allow to cool. 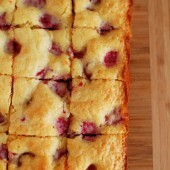 When cool and crisp, break into small pieces. Heat olive oil in a large skillet over medium heat. Saute the brussels sprouts, stirring occasionally, for 6-8 minutes, until browned in spots. Add dressing and toss to coat. 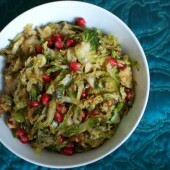 Toss in candied walnuts and pomegranate seeds. Adjust seasonings to taste, and transfer to a serving bowl. Serve warm. This looks delicious! I love that you guys plowed through it as an afternoon snack! 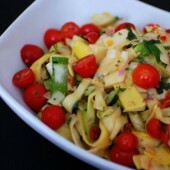 I love using veggies as a healthy substitute for pasta. My favorite is a little more obvious – spaghetti squash! Also, I got your DM about the photo. I’ve been crazy busy but I’ll email it to everyone tonight! This looks so good! Yummy produce is really the only thing I’ll miss about summer time. I came across your site earlier today while searching for a pumpkin spice cheesecake brownie recipe (which I plan on making tomorrow btw). You have some great recipes and I’ll definitely be returning! What a great vegetarian dish. With all those gorgeous colors it’s a feast for the eyes as well as for the palate. What a gorgeous dish. It looks super delicious too.